NOVOAZOVSK, Ukraine -- Ukraine accused Russia on Thursday of entering its territory with tanks, artillery and troops, and Western powers said Moscow had "outright lied" about its role and dangerously escalated the conflict. Ukrainian Col. Andriy Lysenko said that two columns of tanks and military vehicles rolled into southeastern Ukraine from Russia on Thursday after Grad missiles were fired at a border post and Ukraine's overmatched border guards fled. Echoing Lysenko's comments, a senior NATO official said at least 1,000 Russian troops have poured into Ukraine with sophisticated equipment, leaving no doubt that the Russian military had invaded southeastern Ukraine. "The hand from behind is becoming more and more overt now," Dutch Brig. Gen. Nico Tak said at NATO's military headquarters, adding that Russia's ultimate aim was to stave off defeat for the separatists and turn eastern Ukraine into a "frozen conflict" that would destabilize the country indefinitely. Russia dismissed the allegations, describing the fighters there as "Russian volunteers." The Kremlin has repeatedly denied arming and supporting the separatists who have been fighting Ukrainian troops for four months in the gravest crisis between Russia and the West since the end of the Cold War. At a White House news conference, President Barack Obama said Russia "is responsible" for the violence in Ukraine. Obama said he had spoken to German Chancellor Angela Merkel on the situation. "We agree, if there was ever any doubt, that Russia is responsible for the violence in eastern Ukraine. The violence is encouraged by Russia. The separatists are trained by Russia. They are armed by Russia. They are funded by Russia," he said. "Russia has deliberately and repeatedly violated the sovereignty and territorial integrity of Ukraine. And the new images of Russian forces inside Ukraine make that plain for the world to see," Obama said. Obama said, "We are not taking military action to solve the Ukrainian problem," but added that Moscow had already been hit with stringent sanctions whose effect will be increasingly felt. 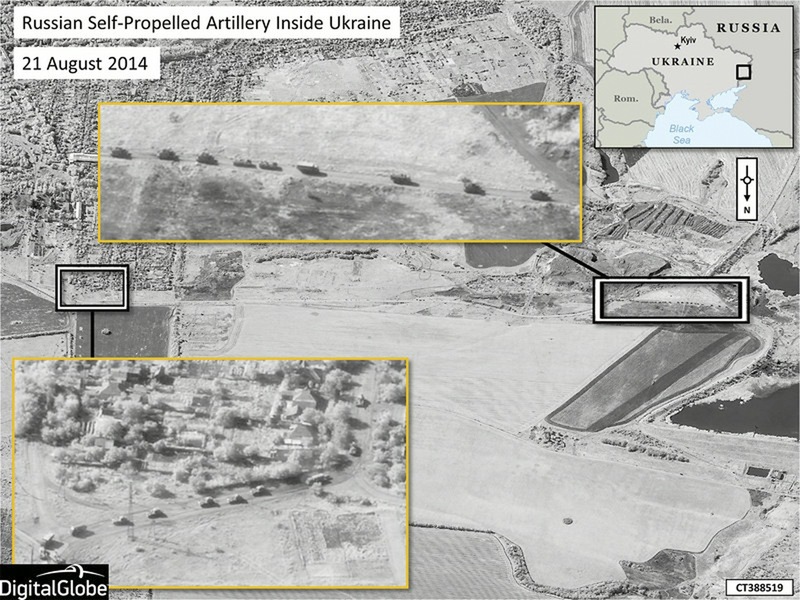 NATO also produced satellite images to provide what it called additional evidence that Russian combat soldiers, equipped with sophisticated heavy weaponry, are operating inside Ukraine's sovereign territory. "This is highly sophisticated weaponry that requires well-trained crews, well-trained command and control elements, and it is extremely unlikely that this sort of equipment is used by volunteers," Tak said. In Moscow, Russian President Vladimir Putin called on pro-Russian rebels in eastern Ukraine to provide a" humanitarian corridor" so Ukrainian government troops could flee the fighting, Reuters news agency reported. "I call on the militia forces to open a humanitarian corridor for encircled Ukraine servicemen in order to avoid pointless victims, to allow them leave the fighting area without impediment, join their families ... to provide urgent medical aid to those wounded as a result of the military operation," he said in a statement. Putin also said Russia would continue to provide what he called humanitarian aid to civilians in eastern Ukraine. At an emergency session of the U.N. Security Council, Western representatives expressed outrage. "Now we see irrefutable evidence of regular Russian forces operating inside Ukraine," said British Ambassador Mark Lyall Grant. U.S. Ambassador Samantha Power said Russia "has manipulated. It has obfuscated. It has outright lied." Russian Ambassador Vitaly Churkin offered a spirited defense, saying Kiev "is waging war against its own people." He did deny not the Russian presence, saying "there are Russian volunteers in eastern parts of Ukraine. No one is hiding that." But Power countered: "A Russian soldier who chooses to fight in Ukraine on summer break is still a Russian soldier." Churkin questioned the presence of Western advisers and asked where Ukrainian troops were getting weapons. He said he wanted to "send a message to Washington: Stop interfering in the internal affairs of sovereign states." "The U.N. stood helpless, because of Russia's opposition to action, and, ultimately, its veto power - even with thousands of Russian troops in Ukraine and a statement by the secretary-general warning that the international community cannot allow the situation to escalate further," CBS News' Pamela Falk reported from the U.N.
"With President Obama saying that a military solution will not be forthcoming, the inaction at the U.N. leaves Washington - in coordination with European partners - with little to do other than increase targeted sanctions, with the hope that Russia begins to de-escalate," Falk said. In Ukraine, President Petro Poroshenko canceled a foreign trip and called an emergency meeting of his country's security council. "Russian forces have entered Ukraine," he said. "Today the president's place is in Kiev." "Destabilization of the situation and panic, this is as much of a weapon of the enemy as tanks," Poroshenko told the security council. As Poroshenko spoke, the strategic southeastern town of Novoazovsk appeared firmly under the control of separatists and their Russian backers, a new, third front in the war in eastern Ukraine between the separatists and Poroshenko's government in Kiev. The Reuters news agency reported that Ukraine's defense and security council ruled that the country will re-introduce mandatory military service staring this fall from this autumn, but conscripts will not serve in the war zone. The Reuters news agency reported a member of Russian President Vladimir Putin's advisory council on human rights said Thursday she believed Russia was carrying out an invasion of Ukraine. "When masses of people, under commanders' orders, on tanks, APCs and with the use of heavy weapons, (are) on the territory of another country, cross the border, I consider this an invasion," Ella Polyakova told Reuters. Lysenko, the Ukrainian colonel, said the missiles from Russia were fired at Ukrainian positions in the southeast about 11 a.m. and an hour and a half later, two columns, including tanks and other fighting vehicles, began an attack. They entered Ukraine from Veselo-Voznesenka and Maximovo in the Rostov region of Russia. Russian stock markets dived as Switzerland joined the European Union in imposing restrictions on Russian state banks and fears grew that the U.S. and EU could impose further sanctions on Russian businesses and individuals in response to the military escalation. Russia's MICEX index dropped nearly 2 percent on Thursday, and major Russian state banks VTB and Sberbank dropped more than 4 percent. "Over the past two weeks we have noted a significant escalation in both the level and sophistication of Russia's military interference in Ukraine," Tak said in Casteau, Belgium. "Russia is reinforcing and resupplying separatist forces in a blatant attempt to change the momentum of the fighting, which is currently favoring the Ukrainian military." Tak, the Dutch general who heads NATO's crisis management center, said the satellite images were only "the tip of the iceberg" in terms of the overall scope of Russian troop and weapons movements. NATO also has detected large quantities of advanced weapons, including air defense systems, artillery, tanks and armored personnel carriers being transferred to separatist forces in eastern Ukraine," he said. "The presence of these weapons along with substantial numbers of Russian combat troops inside Ukraine make the situation increasingly grave." The U.S. government also has accused Russia of orchestrating the rebel campaign and sending in tanks, rocket launchers and armored vehicles. "These incursions indicate a Russian-directed counteroffensive is likely underway in Donetsk and Luhansk," U.S. State Department spokeswoman Jen Psaki said. She voiced concern about overnight deliveries of materiel in southeast Ukraine near Novoazovsk and said Russia was being dishonest about its actions, even to its own people. Russian forces, she said, are being sent 30 miles inside Ukraine, without them or their families knowing where they are going. She cited reports of burials in Russia for those who have died in Ukraine and wounded Russian soldiers being treated in a St. Petersburg hospital. On Thursday morning, an Associated Press journalist saw rebel checkpoints on Novoazovsk's outskirts and was told he couldn't enter. One of the rebels said there was no fighting in the town. In Mariupol, a city of 450,000 about 20 miles to the west of Novoazovsk, a brigade of Ukrainian forces arrived at the airport on Wednesday, while deep trenches were dug a day earlier on the city's edge. "The positions are being strengthened," the spokesman said. "The road from Novoazovsk to Mariupol is under the control of Ukrainian troops." Associated Press journalists on the border have seen the rebels with a wide range of unmarked military equipment - including tanks, Buk missile launchers and armored personnel carriers - and have encountered many Russians among the rebel fighters.